On Sky Factory 3 there is a week long Chisel&Bits event going on! Make your own sculptures to get voted on by the admins and the top 3 will get a grand prize! -Sculptures must be renamed to your in-game name. -Submit your sculptures by throwing them into on of the graves in the event area at spawn. The staff team will then decide the winner based on: Creativity & Design. 3rd place) 1 item pack of your choice The sculptures must fit the theme of Halloween. The event ends on the 5th of November Good luck and bombs away! Halloween Sale, Chisel Competition, and Events! It's time to kick off the SpOokY SzN with all kinds of exciting stuff happening all over our network! Here's your FTB rundown! It's time to celebrate the spooky season with all sorts of fun events and activities, including the return of the oh-so successful SF3 Chisel Competition! The staff team will determine the winner by judging creativity and design! Second Place: 1 item pack of your choice, and 3 of each crate key! 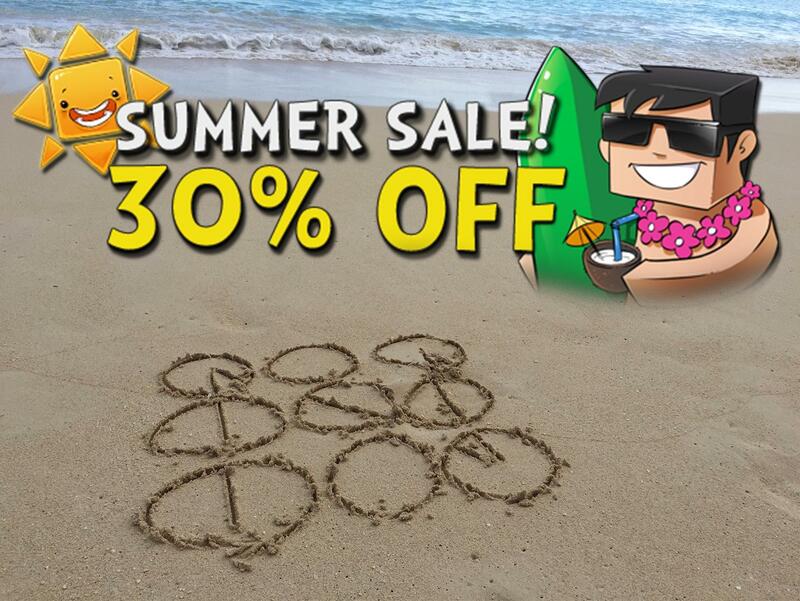 Third Place: 1 item pack of your choice! The event ends at 12pm EST on October 31st, so be sure to submit before then! Also, take part in our specially themed weekly events! Can you make it out of the Haunted Maze? Can you make the spookiest build in Creepy Constructions? Direwolf20 v2.3.0 - Update, Reset. and Changes! After a (very) long time, our Direwolf20 modpack server is finally back online, updated to 2.3.0, and refreshed with a brand new world and some exciting new changes! Moving into the 2.0 versions of the modpack there are tons of mod changes (new mods too! ), so make sure you read over the changelogs (link below). The most notable change on our server is the discontinuation of the Nations plugin; While we didn't want to get rid of this, we weren't left with another option as it's become so outdated that it no longer functions properly with current versions of Forge. Fret not though, as situations like this always have an upside! We have decided to transition to a brand new version of GriefPrevention - but Mike, GriefPrevention isn't new! It's already on other TheNodeMC servers! You're absolutely right it isn't new - but GriefPrevention Towns is! This new system includes three different layers of creating and customizing protections to suit your own needs and allows you to collaborate with other players to build towns very similar to Nations and Towny! We are one of the first servers to be using the newly updated version of this plugin (seriously, this version came out two days ago. ), so there maaay be a few blips here and there but rest assured the wonderful devs are active and have already fixed a couple bugs specifically for us! Even if you've played through the Direwolf20 modpack before, this is a great chance to experience it in a whole new way! Keep in mind that taxes are still a thing so make sure you keep your claim bank topped up! 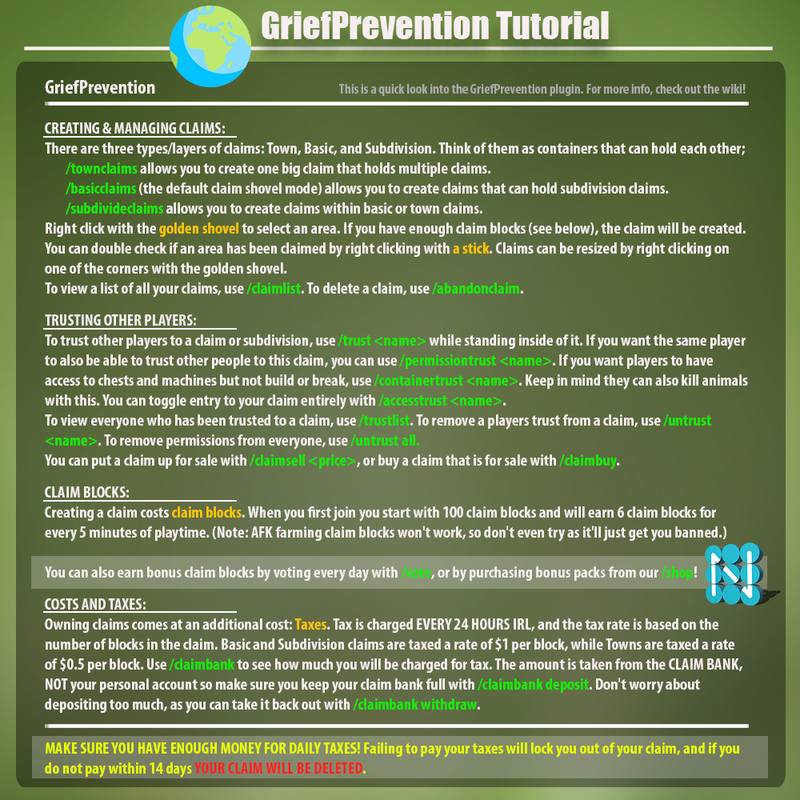 For a quick GriefPrevention Towns tutorial, take a look at the handy graphic below (or type '!dwgp' in our Discord!). Come and join us at dw.thenodemc.com! We have updated Direwolf20 1.12 to release version 2.3.0! You need this version to join. Twitch Desktop App: Press the update button! Update button not showing? Click on your modpack/profile, click Versions, and select version 2.3.0. It should be marked with "(Release)"! aye is the SF3 server down? Mike, do rank transfers still work like they used to in the old days, I was wondering if I could get my old DW rank on the New DW server. Unfortunately Ore Excavation had to be disabled today due to a duplication bug. We are experiencing some issues with our Host atm. We hope to get the servers up and running soon! The server has been updated to release version 3.0.14. Make sure to update your modpacks to be able to join! is the server down i cant connect? Because the automation hasn't been working properly. I've been in contact with Enjin support this past week trying to get it resolved. Why are people asking for rank??!!! how do I get recruit now? Can I have my rank? This is a great server! The Curse/Twitch launcher has the mod pack its called "Sky Factory 3" download it then you should be able to join. Hello. I am very new to this group and not really sure how to get started.
! But i didn't get my recruit rank yet :(? any help? What is the modpack for this? Thanks! Please be aware that our discord servers are down due to an area conneciton failure. We'll let you know when they are up asap! Yes, the server is updated to 3.0.13! did the sf3 server update? with the new sf3 upodate? hey I'm having trouble connecting, I just updated my modpack through technic launcher and now it won't let me join. What do I do? Really silly question might be obvious. But are we allowed to build to the rims over our island claims? You can now use "/ch l" to speak in local chat with your island mates! If you want to go back into global chat, use "/ch g"
Mob spawning rates have been tweaked on the server. It should now be much easier for you to get animals and farm mobs! How Do I get my rank on the server?